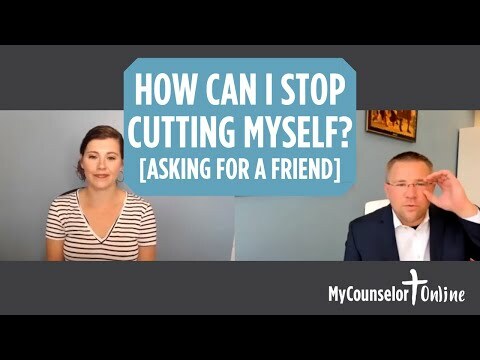 How can I stop cutting myself? Welcome to my counselor online. I’m Cassie, and this is asking for a friend that’s a place where you submit your questions, or a friend or for yourself. And I tracked down one of our therapists to answer your question today I have Josh with us. It was going to answer a question from Alisha in Indiana. So here’s the question. How can I stop cutting myself. JOSH, WHAT DO YOU WANT TO SAY. Hey, well first I want to say thanks for your courage deletion kind of reaching out for help. And it’s a little scary when you’ve got a compulsion like that and you’re not sure what to do about it, but you don’t know How to stop doing that. And so appreciate your, your courage and submitting the question. So let’s talk for just a few minutes about What cutting as about and self harm is generally about from a clinical perspective. Generally cutting is about a using our body’s hormones associated with pain relief as a way of modulating our emotions. So when we have emotions that we don’t know what to do it that are overwhelming for us. If I’m feeling numb and I don’t feel alive if you hollow inside. I may cut to feel pain to feel something, and that in the field live net at other times. I may cut because I feel unseen unheard on cared about and my cutting as a way of trying to communicate my need for help to those around me. And so in order to stop so farms start cutting. If you want to first got to understand what is it serving What purpose does it serve and in my life. And so what am I using the self harm. What am I using the cutting to manage in my life and how do I go about caring for that in a healthier way. In a way, other than cutting. And so, in a nutshell, or in the shortest explanation. That’s how we understand self harm and cutting, generally speaking. And the process that we as counselors walk through with folks in helping them to stop so farm we help them identify the purpose of the cutting a serving in their life. Okay, yeah, that’s really good information. Josh, thank you for your time to answer this question for Alicia, Alicia. Thank you for your question. If you have a question, you can use the form on our Asking for a friend page and submit it and I will track down one of our counselors to answer that question. It will post on the Asking for a friend page and also in an upcoming edition of our weekly e newsletter. So check it out. Depression or Grief: How Do I Know?